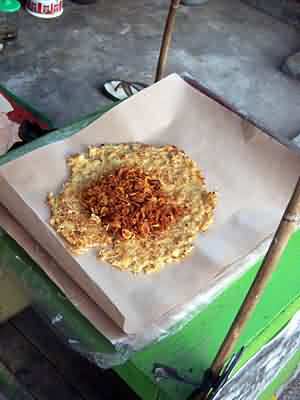 Kerak Telor or Eggs crust is Betawi native foods that have been around since ancient times and is a Jakarta typical food which was already scarce encountered. Its existence started to run over as fast food fast-attack in Indonesia society. In the former Dutch colonial period, egg crust elite had become typical foods of the famous delicacy Betawi taste. The food is served at a party and a celebration of the authorities at that time. But increasingly over time, the presence of western culinary replacing the position of this egg crust. Eggs crust is Betawi traditional foods processed with ingredients like white sticky rice, eggs (chicken/duck), ebi (salted dried shrimp) roasted dry with onions, then given a refined flavor of toasted coconut, red chilies, kencur, ginger , pepper, salt, and sugar granules / sand. How to cook is also quite unique. When the crust was undercooked eggs then reversed and pemasaknya pan crust left eggs directly exposed to heat from the charcoal brazier hence become a little burnt. This is what we called the crusts. The price was very affordable at around Rp.5000 (US $0.5)to Rp.7500. This price can be much more expensive when the crust of the egg now can we meet at the big malls. It was no less delicious compared to modern foods such as D’creeps, or Omlete Burger. But it’s getting difficult to find this food. 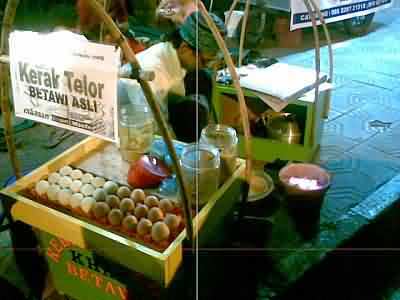 Only in Babakan Setu whose majority are indigenous Betawi and included in the environmental community culture preserved by the Government of Jakarta eggs crust is a little easy to get. Saturday and Sunday are the busiest days to sell, because visitors usually come on the holiday. For crust egg merchant, holiday’s most-awaited moment because the turnover is usually high. In ordinary day, egg crust merchants selling only on crowded places like malls and even so the turnover is not so good. 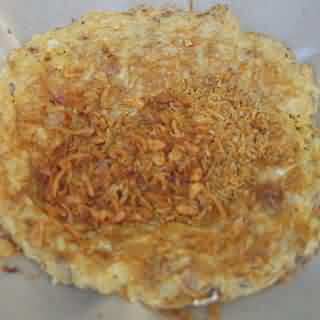 So, if you visit Jakarta, don’t forget to get this kerak telor. Enjoy!.